Thousands of theme park fans follow the construction progress of Heide Park Resort’s newest attraction on facebook. Day by day new theming elements, effects and high class speakers will be installed inside the building. But with every piece of this huge puzzle, the vistors will be taken more and more into another world by entering the maze after its grand opening on March 23th. But away from the construction side, behind closed studio doors, the IMAscore composers and sound designers are producing the soundtrack and sound design for the horror maze “Krake lebt!”. These days, the two month long work finally comes to an end and after all the time spend on frightening sounds and moody pieces of music, one thing is for sure: when it’s done, it will be an unique acoustic experience. For the first official audiotest a few days ago, the whole team of IMAscore was at the park to take a listen to the music and sound atmospheres on the installed sound system. 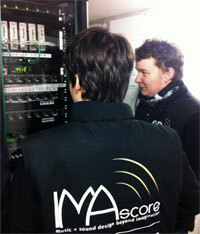 On the basis of the results, IMAscore will conduct changes to achieve the perfect sound. It won’t be long until visitors of Heide Park will go on a acoustically adventure within “Krake lebt!”. As of now Galaxy Quest is available for PC!